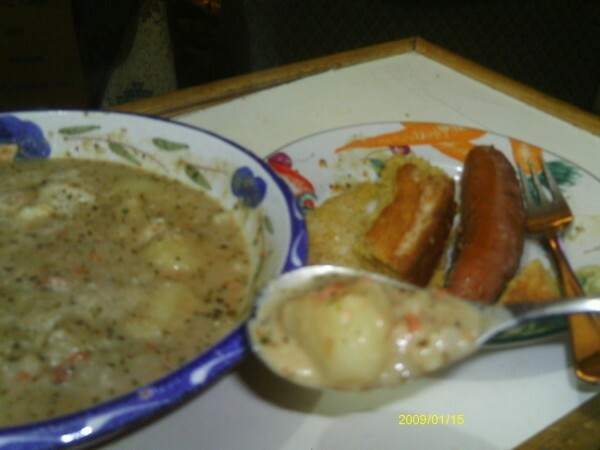 This page contains potato and sausage soup recipe. A hearty dinner can be made adding sausage and some hot spices to a potato soup. This is a bit of a change for potato soup, a little heartier and spicier than the usual, with a touch of heat. I don't slice the sausage up, I just cook it in the soup to heat the sausage up, and give the soup a little more flavor. I did it this way to please the household, but slicing the sausage up to add to the soup would be really good. Saute the celery in bacon fat or olive oil for 5 minutes (I use bacon fat for flavor), then add the onions. Cook until nearly done, since the potatoes won't take long to cook. Add the cumin and hot pepper a minute or two before you add anything else - cumin benefits from a brief saute in oil. Then add in the potatoes and stir it all together to combine. Add water within about an inch short of covering the potatoes. Add the bouillon and the marjoram. 10 minutes before potatoes are done, add the sausage and simmer briskly. When the potatoes are tender, remove the sausage and keep warm. Mash some of the potatoes right in the pot, if you want the soup a bit thicker. Then mix the yogurt and milk and stir it in slowly, stirring the whole while. Bring the soup back to a simmer, and remove from heat. Serve. This sounds really good! Great for a cold fall day .. Going to try this one for sure! Thanks for posting. Your soup sounded like just the thing for a rain fall day, so I made it, but had to adjust for my lactose intolerance. It was deelish! As my husband says..."that's a "do again"!" Thanks for sharing! My hubby loves potato soup, just about anyway you can make it. I've never added much other than a little salt, pepper, butter and cream or milk, but I'll try a good sausage too. This old dog is still learning.